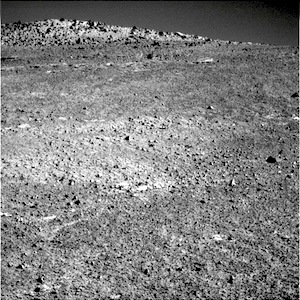 Opportunity’s right-hand Pancam images a target on Murray Ridge dubbed Cape Upright; in the background, a portion of the McClure-Beverlin escarpment lies on the skyline. More Opportunity raw images, its mission status, and the rover’s latest location map. This entry was posted in Reports and tagged Cape Upright, Endeavour Crater, Mars Exploration Rover, McClure-Beverlin escarpment, MER, Murray Ridge, NASA, Opportunity, Solander Point. Bookmark the permalink.